Have you ever sat down in a restaurant and thought wow, that much for some salad and croutons? Or, that tastes like cardboard, I can’t believe I’m going to pay for this? Or even, great that was delicious, how can I make this at home so that I don’t have to fork out the dough for it (no pun intended)? I’ve been known to ponder those questions when I’m out dining. Sometimes out loud, sometimes in my head. They all bring me back to square one in my test kitchen, where I try to resolve them. A while ago I came to the conclusion that I was going to try and cook as many of my meals at home as possible. Given the current economic wave we’re riding, I thought it would be doing my piggy bank a great service, and it would also get me into the habit of experimenting more in the kitchen. 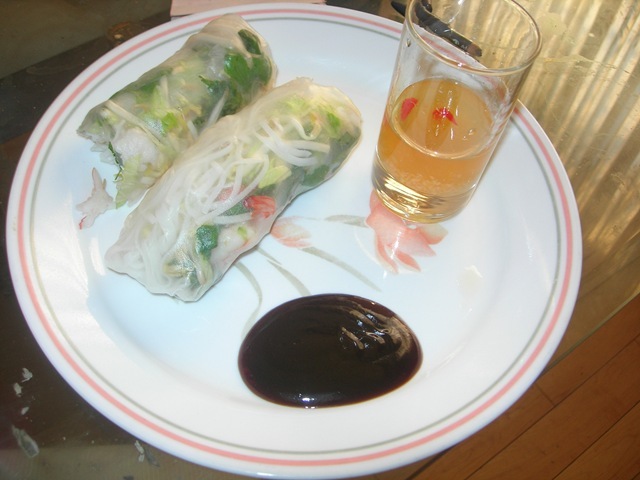 Being a lover of Vietnamese food, and having already semi-mastered the art of Bun Thit Nuong (so I’d like to think ;)), I thought I’d move on to another favourite of mine that I had never attempted myself…The Vietnamese fresh spring roll. The concept was simple enough: A rice paper wrap filled with fresh vegetables, rice noodles, and poached shrimp. However, the key to making this appetizer zingy and over the top were the accompanying condiments. Hoisin, an Asian barbecue sauce with a sweet taste that can be found in Asian grocery stores, and Nuoc Cham, a concoction of fish sauce and flavourings that say hello to your tingling taste buds upon each dip. Soak rice paper one at a time in hot water until it becomes soft and pliable (About 30 seconds). Distribute desired toppings along the top edge of the wrapper leaving a one inch border to either side, and a 2 inch border from the top. Fold top edge of wrapper over filling, then fold in sides and roll tightly. Combine water and sugar, and stir until dissolved. Add remaining ingredients, and stir. That looks amazing! I can’t believe you made that yourself. If I hadn’t known this was your blog, I would have thought that it was a picture of a Viet restaurant food =) Share more recipes please!